In the past week we’ve traveled from the northland (north of Auckland), through Raglan, a peaceful surfing town that I easily could have spent more time in and to the Southwest part of the north island, Hawke’s Bay. We’ve been living almost one hundred percent out of our campervan, with the occasional coffee with new friends or people we’ve met along the way. It has been one adventure after the next, from surfing to fly fishing and awe inspiring hikes to huge waterfalls, every day is epic. The beginning of the week brought about three days of rain. Since we were living out of the van and the only place to practice was outside I shortened my practice by quite a bit just so that I could get something in before getting drenched. Moving from a studio practice to an outdoor practice is like learning a whole new language. My body and breath react differently to both the terrain and the temperature. Every day is like practicing for the first time and saluting the sun took on a whole new meaning. 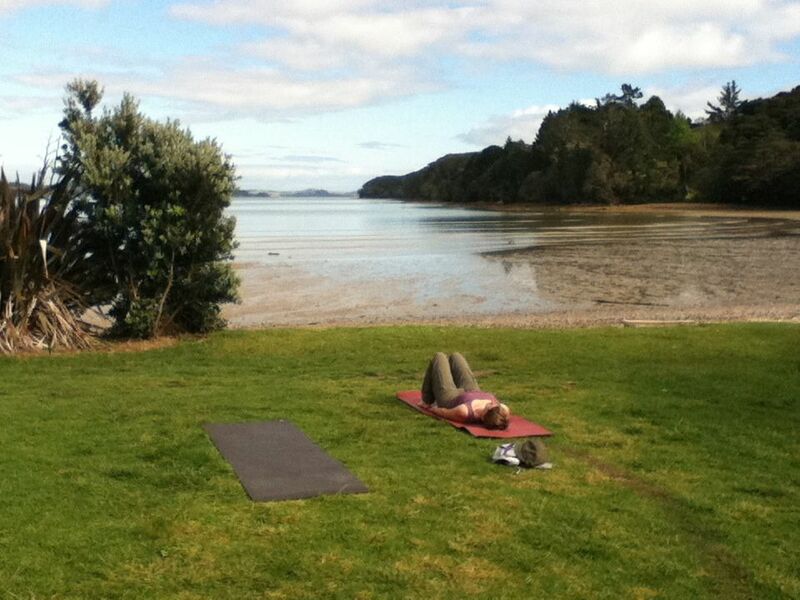 To change things up a bit I did take a day off of my usual Ashtanga practice to take a vinyasa class in Raglan with the local yoga teacher, Anna. It was kind of fun to change my routine and try new things, practice poses that I don’t usually get to like Ardha Chandrasana and Warrior III, both poses I loved and practiced all the time before committing to Ashtanga. It also solidified for me the reasons I do the practice I do. Ashtanga has become less about achieving the perfect pose and more about moving with my breath and allowing my mind to become clear and focused because my body already knows what pose to go to next. That rarely happens in vinyasa classes since every class is different. At the end of the week I’ll be teaching my first officially schedule class since we landed in New Zealand. I am a bit nervous but mostly excited and craving the familiarity of teaching. Since I began teaching I haven’t ever gone this long without it and I cannot wait to get back into it. I’ve been teaching little bits and pieces to the people we’ve stayed with in exchange for their generosity but tomorrow I get one hour and 45 minutes to enjoy being in a studio and teaching to new students. I can’t help but smile as I write this, I love teaching and it warms my heart to be able to share yoga with a new audience on the other side of the world.